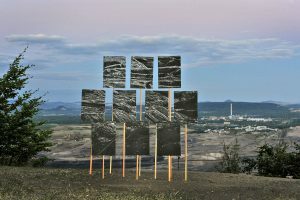 Art for climate is an art project focused on ecological topics, mainly on the topic of lignite mining. 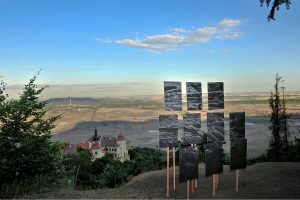 Several art works were realized during the Klimakemp in the summer of 2018 in Louka u Litvínova. 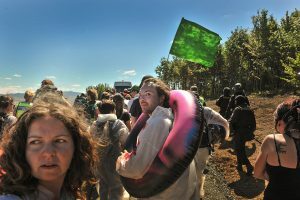 Art works were created for the public space and were presented during the camp or in the context of the direct action. 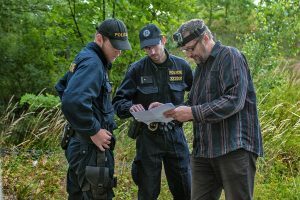 Realization of the art works was often accompanied by monitoring of the Czech Police. 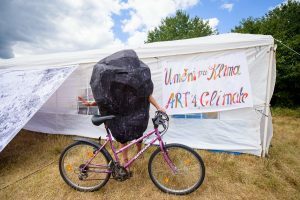 The idea of the project is to use art as a tool for action, aim of the art project is to contribute to the end of coal era and to the future without fossil fuels. Artist created an inscription System Change! 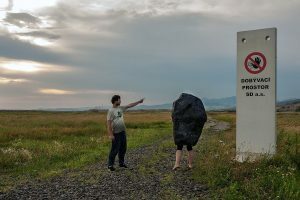 out of red reflective signs and placed it next to the busy street along the coal mine. The slogan becomes visible for a short time when the cars flash light on it. 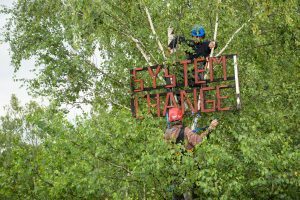 The art work is a silent reminder that the change of the current system is inevitable in order to stop the climate change. 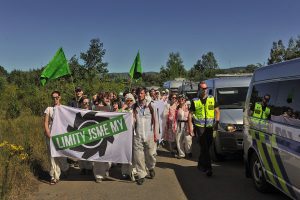 Change of the current system is not very present in the public debate, but it is very urgent and inevitable in order to stop the climate change. Images are powerful. For better or worse, they possess the ability to alter perspectives and influence views. They shape and change the way we see and ultimately think about the world. 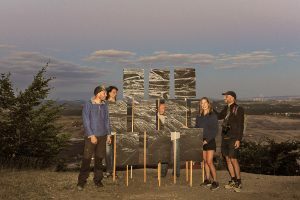 When images can be taken in the hand and thrust into the air, held up as an ideal we strive towards or as an ailment we demand remedied, they can also transform into a form of protest. 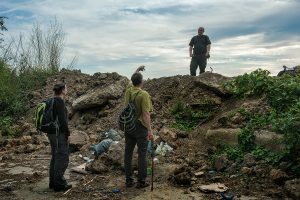 I hope these present-day images will soon serve as documentation of landscapes past and a reminder of what was fought against. 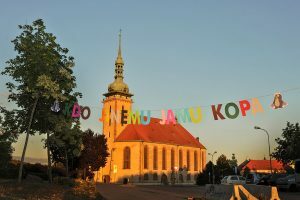 The text for this project derives from the Czech proverb, Kdo jinému jámu kopá, sám do ní padá. The English interpretation means: who digs a hole for others will fall in it by her/himself. 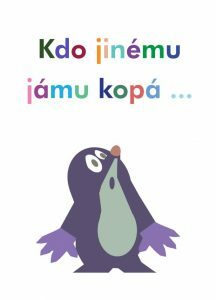 The concerned looking figure of a mole accompanying the text recalls a famous Czech cartoon character who is always portrayed as saving the day. 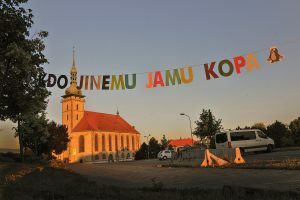 Text installation was realized in front of the gothic church in Most, which was moved to an other location and saved from the demolition in 1970s. 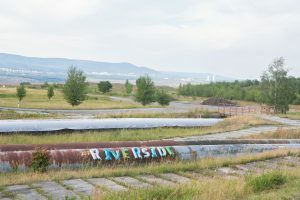 The river Bílina is passing by a coal mine. Because of the mining it was imprisoned in giant tubes, where it continues to flow for more than 3 kilometers. Seeing the rusty metal tubes no one would think, that there is a vibrant river in them. 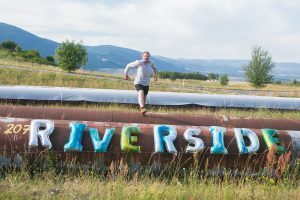 Artist Markus Hiesleitner brings attention to this absurd situation by positioning the slogan “riverside” next to the tubes. The letters are inflatable and remind us of inflatable toys and summer vacation. The iflatable letters and summer toys dirty from coal were also used in the march for climate justice. 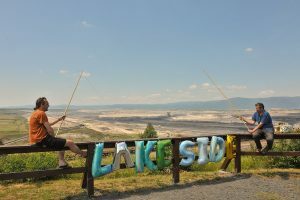 Iflatable letters are positioned as a slogan “lakeside” next to a view into the coal mine Vršany. This ironic gesture is a critical commentary to the human engineering of the nature. 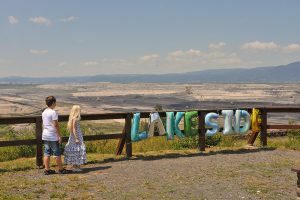 Destructive mining is greenwashed by the mining company as a prospect of an attractive lake holiday resort in 2051. Coal is the driving force of the human society since the discovery of the steam engine. 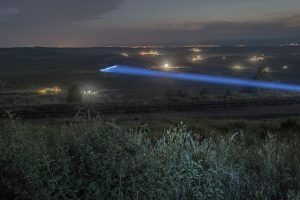 It is the battery, concentrated energy of the sun, that was stored in the ground for a millennium in order to be burned and to replace hard physical work. Coal is the driving force behind the industrial revolution, but it has become obsolete. Enthusiasm and faith in a happy future, when a man conquers nature, were replaced by today’s concerns about the state of the planet and of the atmosphere. Coal is still a major source of energy for our households and industry, but few see this resource positively. 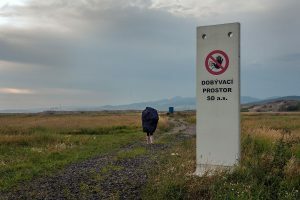 As a lost child, a mascot in the shape of coal wanders around the landscape and tries to find its original place. The place where it belongs. That place is back in the quarry, deep under the soil. 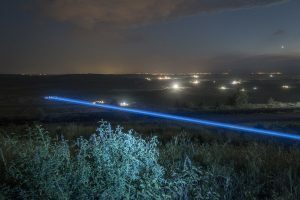 Using laser technology we projected the names of the extinct villages that were once there. 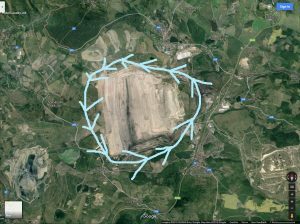 On the current territory of the open pit mines Vršany used to be located: Ervěnice († 1957 – 1988), Vršany († 1978), Pohlody († 1979) and others. 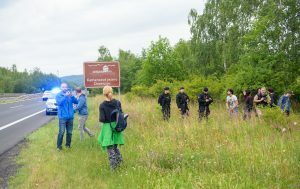 In the districts of Most and Chomutov, more than one hundred settlements disappeared during the second half of the 20th century. 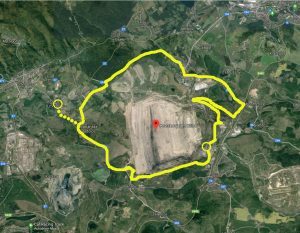 Almost half of all the villages in the region had to retreat to lignite mining, others had to retreat to water tanks, industrial areas or the destruction was caused by a result of the expulsion of Czech Germans. 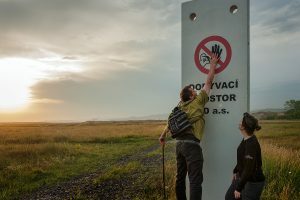 Ibra Ibrahimovič is a well known Czech documentary photographer focusing on photographing Northern Bohemia for more than two decades. 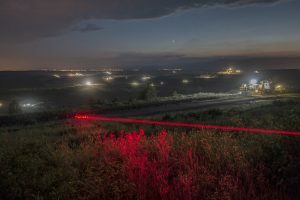 As part of Art for the Climate project he documented all the artistic realizations and also exhibited his photos in the form of prints and photographs. Oliver Ressler is a video artist focusing on political topics. 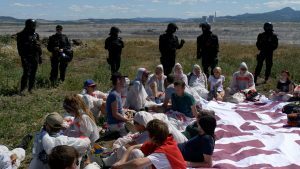 He documents movement for a climate justice worldwide in his short videos. 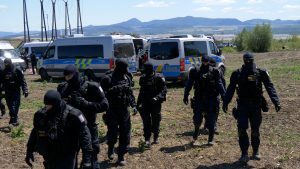 The Department of Security of the Czech Interior Ministry issues each quarter of a year a situation report on extremism. 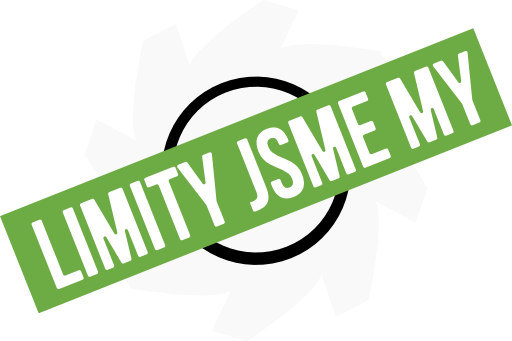 In 2017 it included a reference to Klimakemp and the Limity jsme my movement. 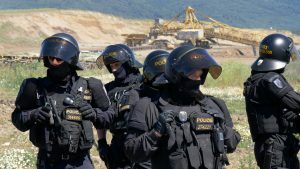 Presence in such a report brings many inconveniences, which was confirmed when the policeman unlawfully asked the local people to prevent Klimakemp in their villages in 2018. Pavel Sterec created a facsimile of the future situation report based on real document, which he magnified from original A4 to lifesize of Klimakemp participants. Enlarged document „from the future“ confronts prediction with current events. 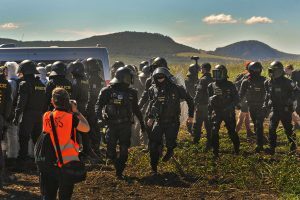 The work raises the question over the „extremismology“ of the bureaucratic apparatus that criminalizes non-violent protest against climate change and marks it as a social danger just because it has a form of a direct action and not just of another paper. 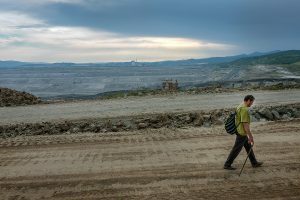 Performer Martin Zet decided to do a walk around the border of the open cast coal mine Bílina. The walk took him 16 hours. Intended meditative experience soon turned out to be a frequent interaction with security and police. 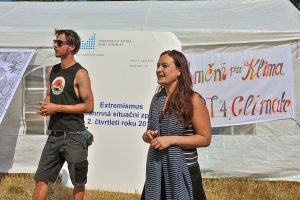 Art project was realized with the financial support of the Czech-German Future Fund.